When you have an idea you make an App to make your idea true. Its most better to consider that End User or Customer will not have any information about usability of your created App. Its very important to provide proper instructions or intro gestures to make your app more familier to Customer. Customers will be happy to use your app as you guide through your app there will be clear understanding of how to use your app even if end user is a stranger. So you can increase more downloads which helps increase your revenue. 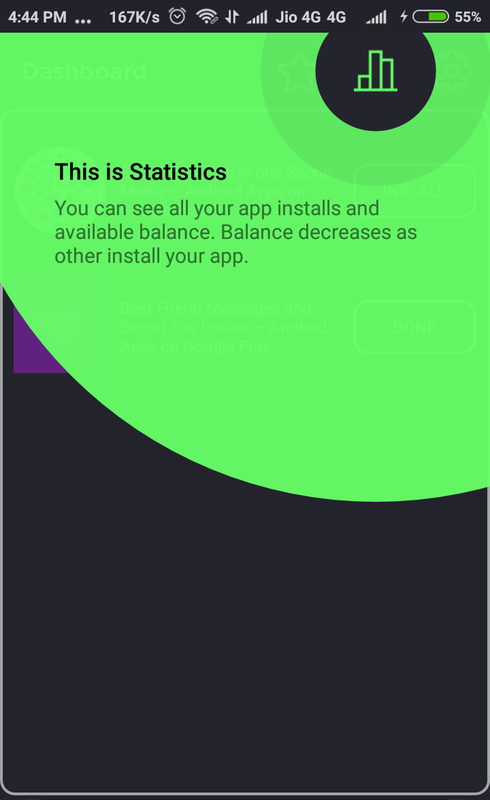 App intro will also make your app more standard and look like company created Android apps. App intro also increases usability of your app and make it more easy to use. So to make such beautiful app intro or guide you need to use better library which will be introduced in this tutorial. Here we will import taptargetview library as it is used to show instructions for your android app. To import taptargetview copy following code into your apps build gradle. Once you have added library to your app gradle and sync project you will be able to use the taptargetview library to provide instruction. Now lets use it into our project to show instructions when user opens your app. Copy the following code in onCreate() method of any activity you wish to show instruction. It can be MainActivity or Dashboard of your project. // We have a sequence of targets, so lets build it! // Executes when sequence of instruction get completes. After copy pasting you can change corresponding toolbar object in your Activity and providing your id of menu instead of mine(R.id.menu_share). Wow! Wonderful thats all for showing toolbar instructions for app when your activity is opened. 2. Showing instructions for any Views inside Activity. .Now lets learn how to show instructions for a Button or any View you would like to tell user about that view and instruct user to use it correctly. Copy the following code to show instruction to exact view you need to instruct user. Where target is the view you want to instruct user. Congradulations! Again you learnt how to instruct user for your app and improve usability of your app. Isnt Amazing! Now you can show instructions on any part of your app, you just need xy Coordinates or bounds. Lets learn this amazing function. // Likewise, you can create multiple targets as you wish. Congradulations! My Friends. Now you have learnt amazing part of Android App Usability Instructions provided to your customers or client. If you need more information about this library you can visit to following link and learn indepth if you are interested. If you want to show instructions only first time the user opens your app you can use SharedPreference to store IsFirstTime status and you can assign some value once user opens your app. Note: I have used my own Library SharedPreference and not SharedPreferences. To get this library go through above sharedpreference Guide link i have provided. Thank you. If you Love post, Please Share and Comment.